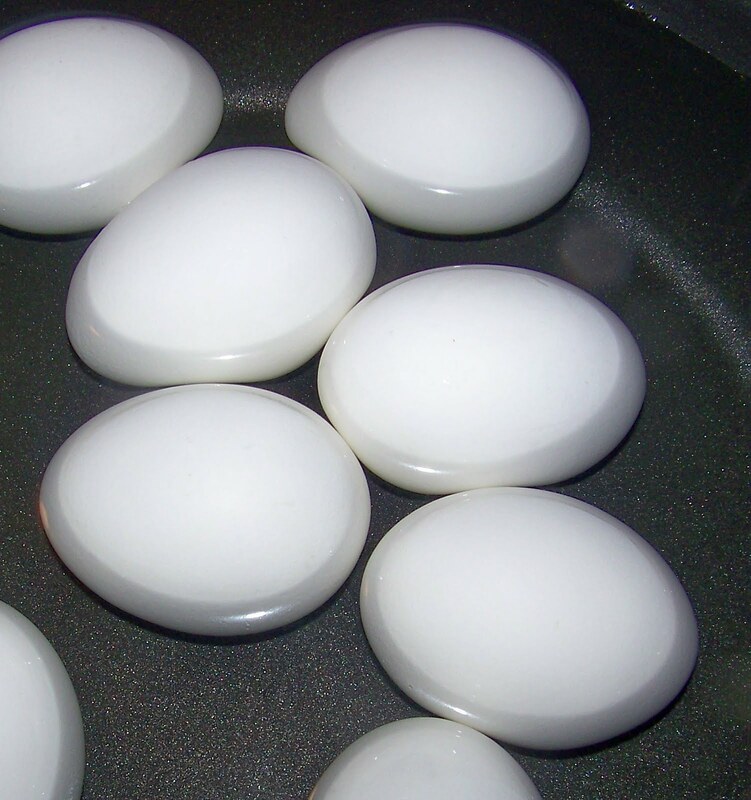 Eggs are healthy, budget friendly and easy to fix. Everyone in my house eats eggs so sometimes when I need a quick "meat" curry to go with a rice and curry meal it's a perfect choice. This is one of my mother's recipes that everyone loves. You can make it as spicy as you want. 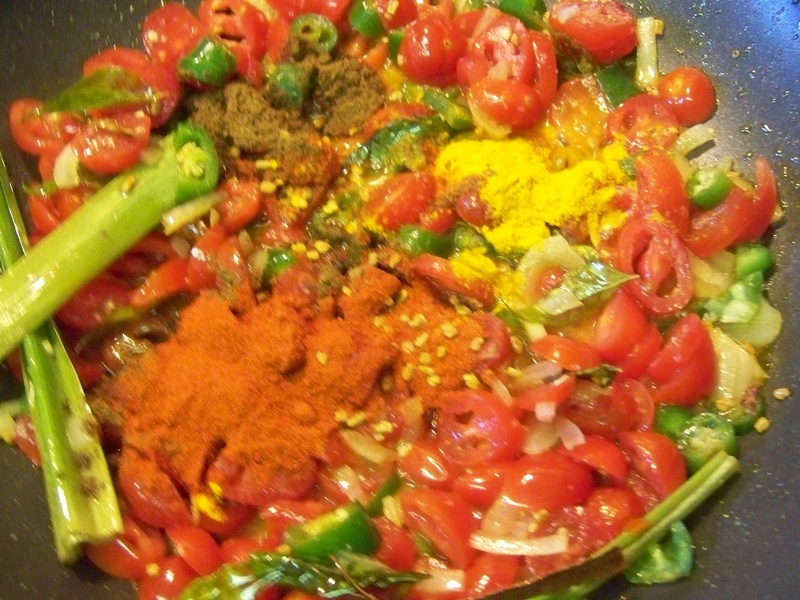 I added 1 tablespoon of chili powder, but you can just add 1 tsp to see how you feel about the spice level. Note: The chili powder in this recipe is from the Indian store and it's from spicy red chilies. Do not use the American "chili powder" that is used in making chili con carne. Boil eggs and peel. Set aside until later. 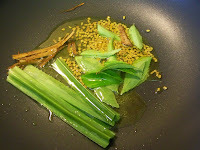 In a large pan, add 1 Tbs of canola. Add curry leaves, pandan leaves, cinnamon stick and fenugreek seeds for 30 seconds to fry. Then add the onions and chilies and saute for another 2-3 minutes. Then add the tomatoes and salt cook for another 2 minutes. 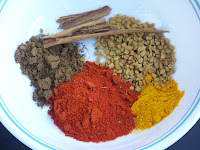 Next add the chili powder, curry powder and turmeric and cook for another 2-3 minutes. Then add the milk and taste for salt and seasoning. 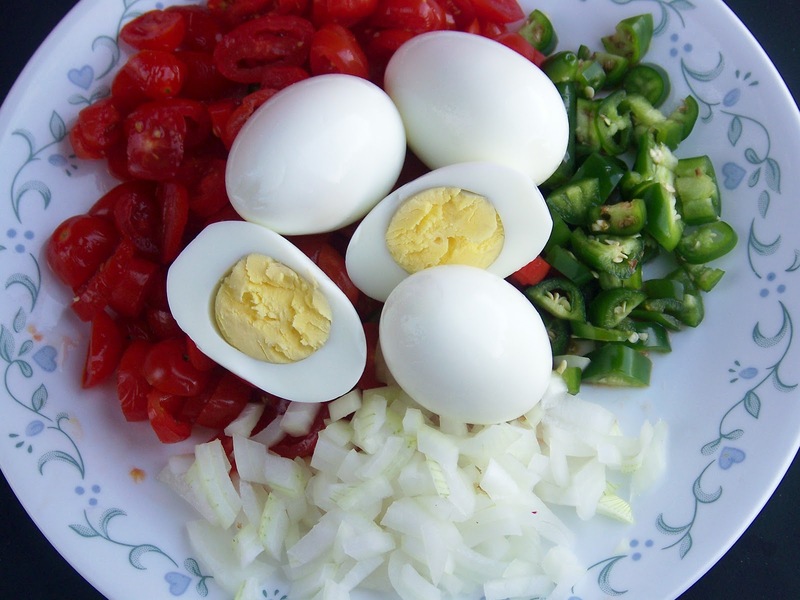 Finally add the boiled eggs that have been cut into half. 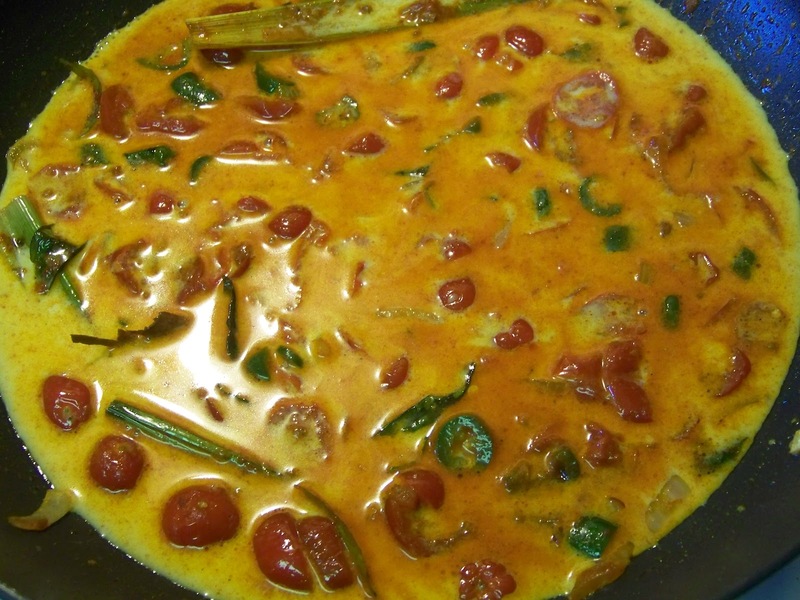 Simmer for a few minutes so the eggs can absorb some of the curry flavors. 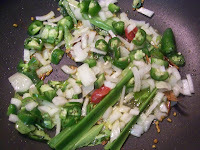 Serve hot with flat breads, rice etc.. Enjoy. 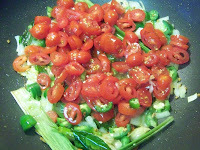 Ramona, I am so glad that you posted this recipe. There was a woman with whom I used to work, from Indonesia, and she would make a big pot of curry every now and then to share with us. There were always eggs in it, too. The curry was delicious, but my co-worker would never share her recipe with us. Now, because of you, I have one that I can cook for my family. Thank you! 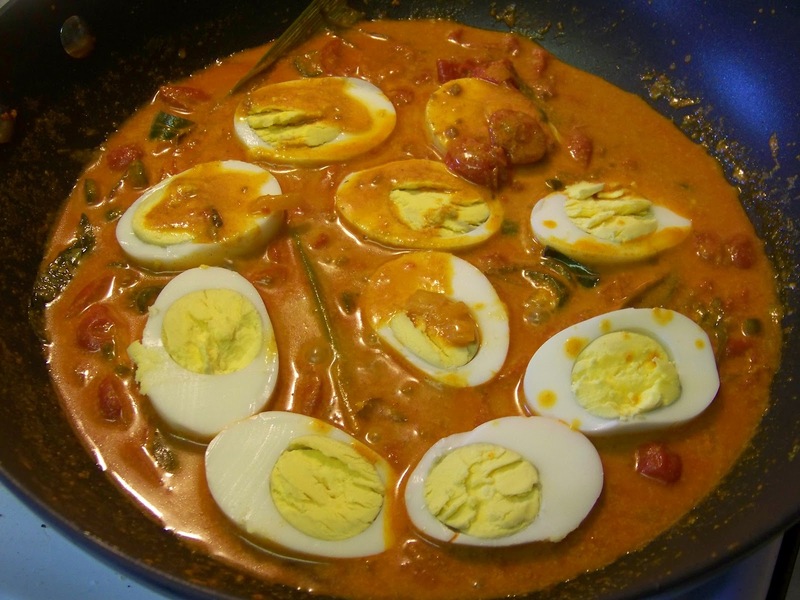 I have had egg curry on my list of recipes for a long time. Yours look so so mouthwatering delicious. Going to bookmark it and give it a try. Thank you and your mom for sharing:) Have a great weekend! Oh my, I am craving spicy dish like this! Gorgeous! 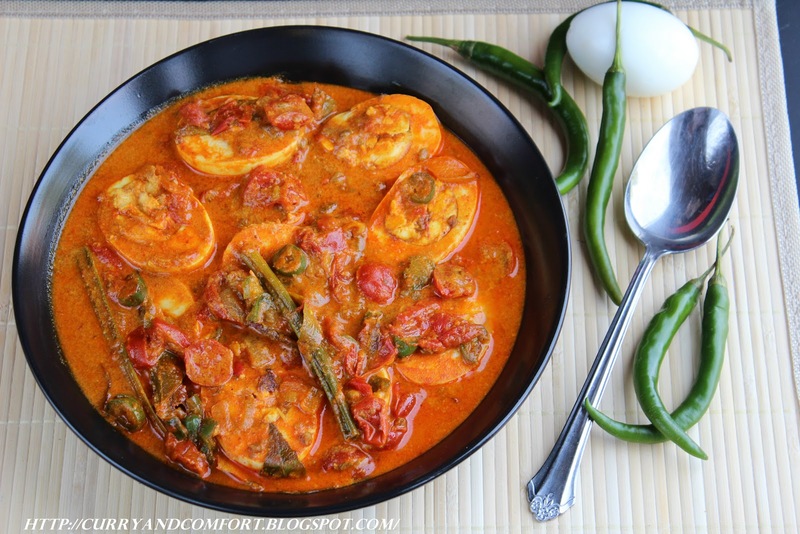 I am suddenly craving eggs and I think this might be the best curry I have ever seen. I seen pre-packaged curry mix in the store. My first thought was that you and my DIL would never use them. We would love all the spice and wouldn't reduce the amount. How interesting! I never thought egg can be in curry. I love to put fried egg on top of curry + rice (it's actually Japanese style curry) but I am now curious to try with the boiled egg. I love egg! First of all, you just reminded me I need to go boil some eggs! :) A boiled egg curry dish...now you've thought of everything! Like Nami - I've put a sunny-side up egg on top of a curry dish before, but never had a curry with boiled eggs. Looks delicious!!! Hope you're having a wonderful weekend my friend! Egg curry and rice is comfort food. Your spicy version sounds to good and has become a must try! I just made some spicy and tangy egg curry and will post it soon. Yours look delicious. Would love to try your version. I tried this yesterday and it's an absolute winner! I had to substitute coconut milk since I had no other in the house, but it worked really well. 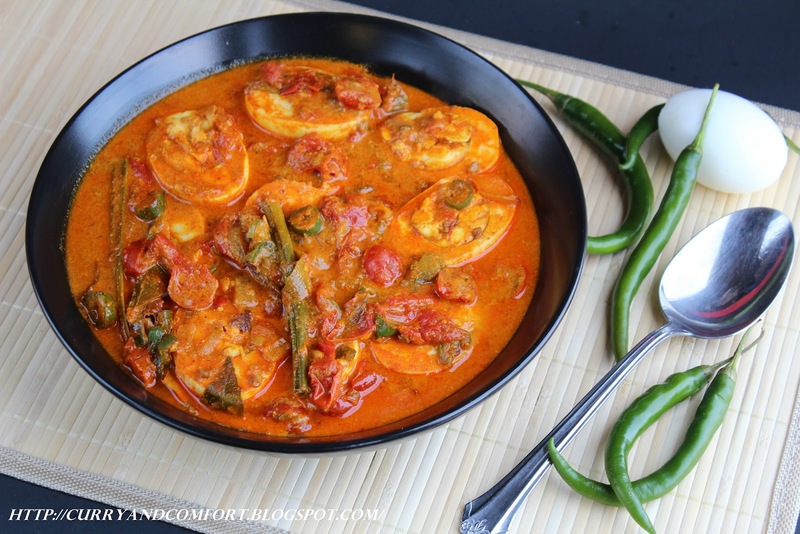 thank you so much for Spicy Egg Curry Recipe giving such amazing and luscious recipes... I appriciate your write up.